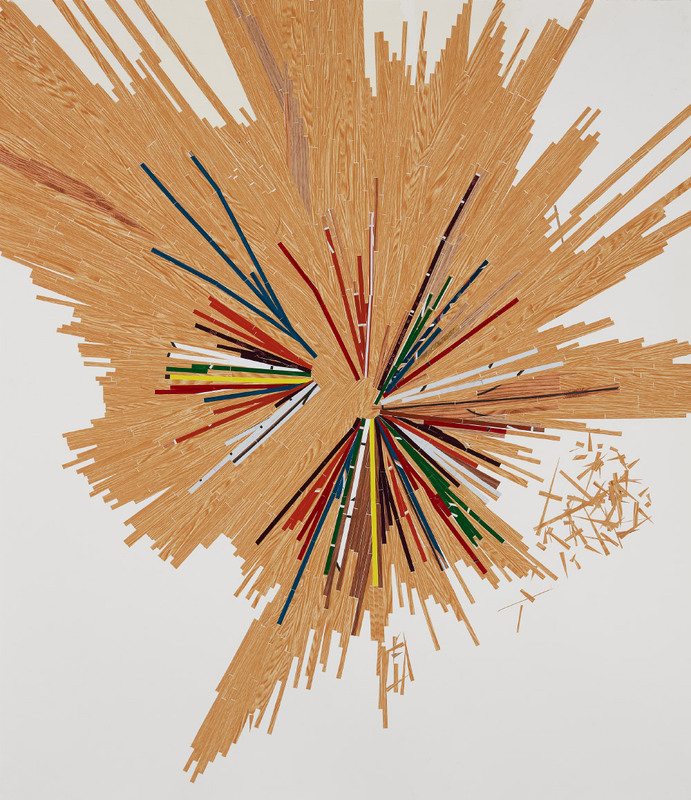 The Whitney Museum exhibition Pacha, Llaqta, Wasichay: Indigenous Space, Modern Architecture, New Art displays seven Latinx artists’ responses to the built environment through construction, land, and space. Curator Marcela Guerrero has brought together 80 recent works and site-specific installations by William Cordova, Livia Corona Benjamín, Jorge González, Guadalupe Maravilla, Claudia Peña Salinas, Ronny Quevedo, and Clarissa Tossin. 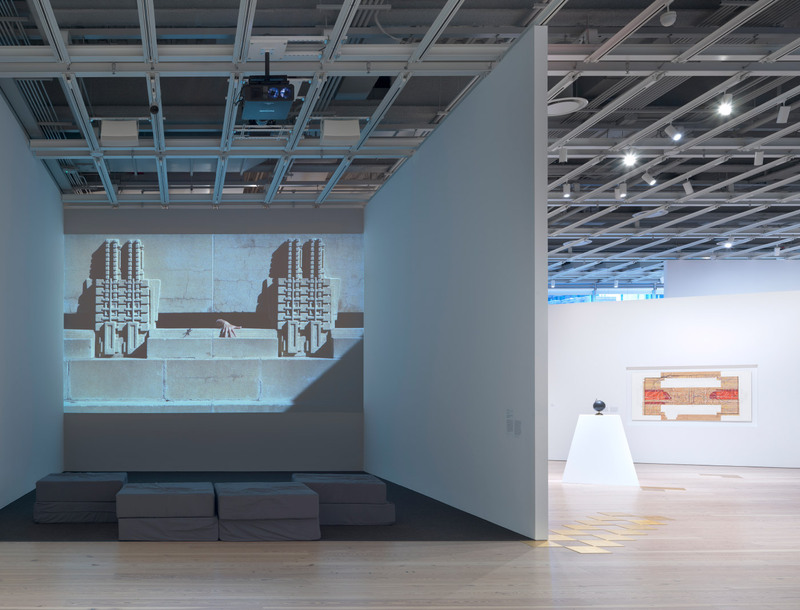 The works display a wide range of references, from adaptations of pre-Columbian temples to migration routes. The title iincludes three words in Quechua, the most common indigenous language spoken today in the Americas. Each has multiple meanings: Pacha is the universe, time, space, nature, world; llaqta, place, country, community, town; and wasichay, to build or construct a house. 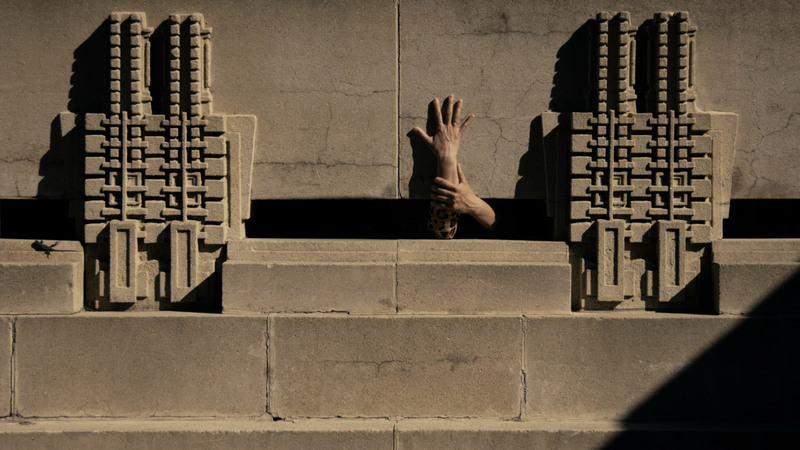 Clarissa Tossin’s video, Ch’u Mayaa (Maya Blue) (2017), was shot at Frank Lloyd Wright’s Hollyhock House in Los Angeles. Tossin moves figures around the temple-like forms to a soundtrack of body sounds and pre-Columbian flutes while demonstrating the performative, ceremonial nature of Mayan (and Mayan revival) architecture. Tossin’s sculptures that surround the video are inspired by reliefs at the nearby Mayan Theater by Mexican artist Francisco Cornejo that referenced both Central America and Hollywood film productions. Ronny Quevedo’s father was a professional soccer player in Ecuador, and his Orders of Magnitude (desde Qoricancha) (2018), Errant Globe (2015), and Ulama, Ule, Olé (2012) use sports themes (here, ulama, a ball game) with imagery of a gym floor, ball courts, and constellations arranged in “maps.” Gold leaf refers to Spanish colonial invaders and is used to render migratory patterns visible, including his own; Quevedo’s family relocated from Ecuador to New York. 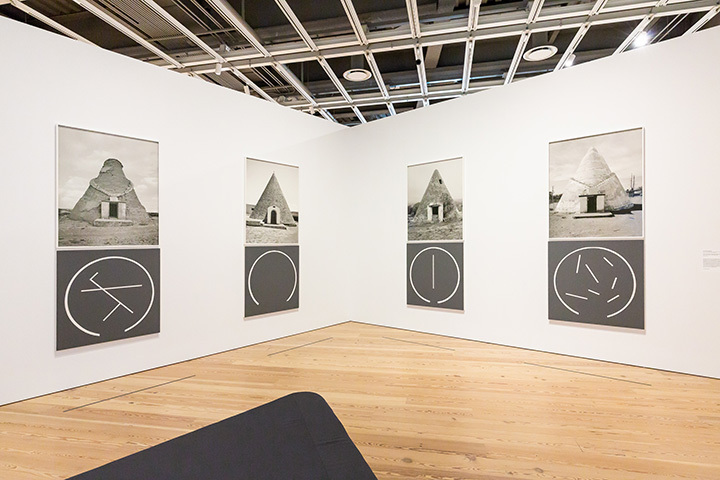 In her photogram series, Infinite Rewrite (2018), Livia Corona Benjamín features Mexican grain silos or graneros del pueblo (silos for the people) built during the Compañía Nacional de Subsistencias Populares initiative from 1965-1999. 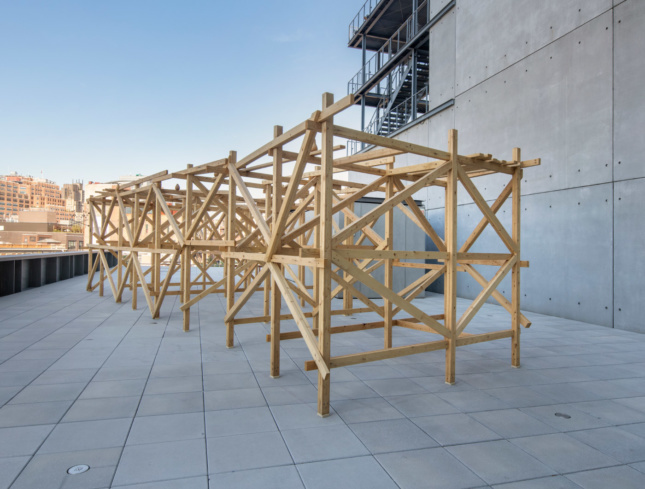 A prototype design by architect Pedro Ramirez Vázquez could be built by farmers with local materials. However, the 4,000 silos that were built were abandoned, and the project ended in failure. These photos, made with multiple exposures that fracture the image almost like mosaics, show how the structures have since been adapted for other purposes: schools, churches, motels. In the gallery, the installation uses 12-foot-tall walls and a floor plan that echoes both the silos’ conical shapes and cruciform plazas. Ayacabo Guarocoel (2018) by Jorge Gonzalez combined Modernism and Puerto Rican Taino (indigenous Caribbean) vernacular in this site-specific installation of a full-height windowed gallery looking eastward. The accordion roof is the mid-century element while the walls are enea (cattail) and dried clay, used in bohíos (huts) and in furniture. He has also made benches specifically for the exhibition. Claudia Peña Salinas’s installation—composed of Cueyatl (2017), Tlaloc MNA (2018), Chalchiuhtlicue MNA (2018) and more—refers to and reinterprets archeological objects at the National Anthropology Museum in Mexico City. The layout is based on the mythical Aztec paradise of Tlacocan. Together, these artworks form provocative insights and interpretations of the architectural landscape and cultural heritage across Mesoamerica and offer tantalizing insights into the contemporary power of indigenous work. Pacha, Llaqta, Washichay: Indigenous Space, Modern Architecture, New Art will run at the Whitney through September 30, 2018.